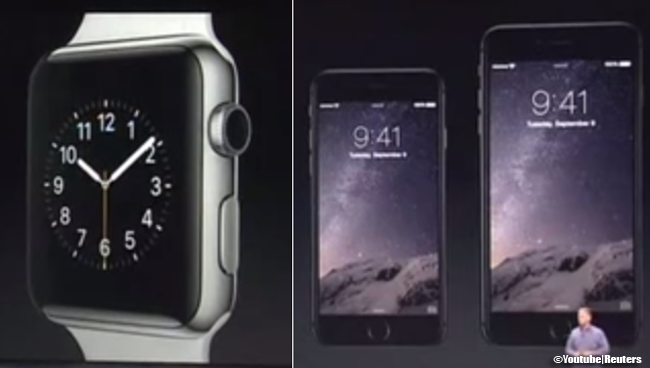 Apple Inc. finally unveiled Apple Watch, iPhone 6 and iPhone 6 Plus, on September 9. Despite the various rumors on what the Apple could have planned, the long wait was over. Most did not anticipate the new way of payment through an iPhone that was introduced by Tim Cook, Chief Executive Officer of Apple. The Apple Watch that had been a buzz a week before it was even introduced, was estimated to fetch $349 when it gets to the stores on 2015. The timepiece has fitness sensors and communication capabilities. It can receive messages and phone calls, play music, be used as a wallet for payments, and monitor health, however, it needs to be tettered with an iPhone. If a person wants to have an Apple watch that comes in three styles of band straps, then he must also possess an iPhone. This seemed to be the downside some considered. Also, rival companies with smartwatches were not able to fetch more in the market. According to Jon Cox of Swiss watch company, he thought that the anticipated smartwatch was not as knock out as he thought it would be. Also, the company took pride of their firsts larger smartphones, 5.5-inch iPhone 6 Plus and 4.7-inch iPhone 6. These iPhone would have the service ‘Apple Pay’ that would give people the ability to pay for their goods without cash or card. Apple’s partners are McDonald’s, Whole Foods and Walt Disney Co.